Fancy giving your wedding or event the Wow Factor? We have international Sax Player, Ellie Sax on our books. A Hed Kandi Resident she will be a guaranteed sensation for any event. Our DJ Becky and Ellie are regularly requested to perform for this amazing package. Get your fix of Hed Kandi kool and glamour and turn your event into a showstopper! International Saxophone Player, Ellie Sax performs at the world’s most exclusive clubs and private events. 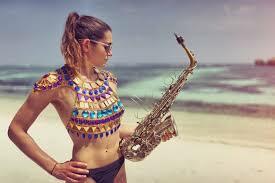 From New Year’s Eve in the Maldives, moonlight raves in the Caribbean, glamorous weddings across the UK and headlining club appearances in Ibiza, Marbella, Portugal, The Cote D’Azur, Cyprus, Croatia and many more, Ellie tours with her saxophone around the world. Performing her awesome live shows for next level clubbing brands such as, Hed Kandi, Nikki Beach Ibiza and Mallorca, Ocean Beach Ibiza, Ministry of Sound and Sintillate. Ellie is taking Saxophone to new levels working alongside DJ’s to bring incredible live performances to the dance music world. An award-winning graduate of the Royal Northern College of Music, Ellie is an extremely versatile artist, excelling in all areas as a saxophonist and vocalist. Having performed at events all over the world alongside her DJ husband Harry, they have countless International bookings and night club appearances to their names. Ellie has performed alongside many heroes of House music including Jon DaSilva, Terry Farley, Dave Law, and Colin Francis as well as sharing the headline billing with the UK’s hottest new DJ talent.